until they were finally doing what it wanted most -- massaging it gums. Dave Anderson, the proprietor of Captain Dave's Dolphin Safari, had taken a group of tourists out to watch whales off the coast of Baja California when the gray whale calf showed up unexpectedly for a bit of attention and some soothing of his teething gums. Even though Anderson does whale watching for a living, this was one of the most fantastic encounters he has ever experienced. Baleen (Public Domain Image)Gray whales are known to be the friendliest whales in the ocean. 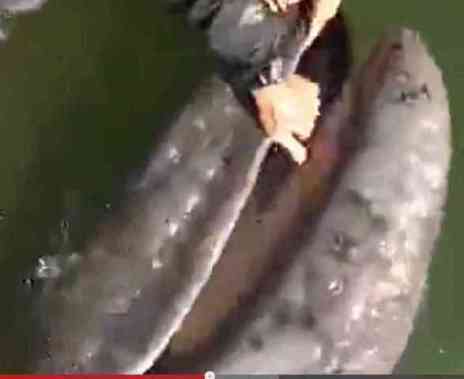 Gray whale mothers have been known to lead their calves to humans to get a bit of physical affection. "Teething" is a bit of a misnomer in this tale, since gray whales do not have teeth. They are baleen whales and filter their diet of small sea animals. The whales take in water loaded with tiny creatures such as krill. 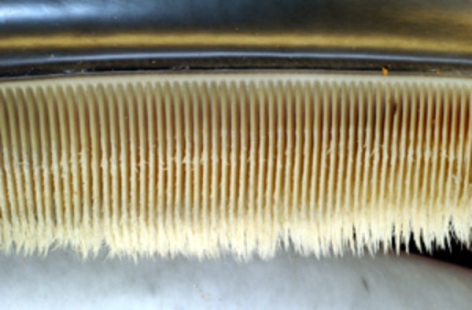 They expel the water and the baleen captures the little crustaceans as food. It is unknown why the calves like to have their gums and baleen massaged, but researchers liken it to the teething actions of human babies. The Aye Aye Animal Video of the Day!! !